Remember when Grey’s Anatomy was the best medical drama on air? It’s definitely been a few years since its genuinely deserved that title. With a new episode airing in just a few minutes, I decided to pay homage to my top 5 favorite Grey’s moments that left me speechless, had me crying, throwing things at the tv or all of the above. Long story short. Man thinks his foot doesn’t belong to him. Doctor thinks he’s crazy. Man steals the chainsaw of another patient (who has accidentally sawed off their finger) to self-amputate the ghost foot. That’s got to hurt. In arguably Grey’s signature episode, a chain of events has left Meredith with her hand inside a body cavity holding unexploded ammunition. With the help of a vision of Dr. McDreamy, she safely hands the explosive to bomb squad captain, Dylan, who is promptly blown to smithereens. Okay, we all knew this was coming, but it still was a shock. The removal of a tumor has left patient Nick’s carotid artery only covered by a thin layer of skin. While scheming with Lexie on how she should get revenge on Alex for cheating on her, his artery explodes, showering Lexie with a pool of his blood. It’s like Carrie. But worse. The husband of a former patient of Derek’s comes to Seattle Grace to extract revenge on everyone involved in the death of wife. Owen, Alex, Reed, Percy and countless others get wounded in the process. Gary Clark finally finds the neurosurgeon and Derek calmly talks him down, BUT THEN April distracts Derek for mere seconds and Gary takes the opportunity to fatally wound Dr. McDreamy. I have no idea why they kept April around. 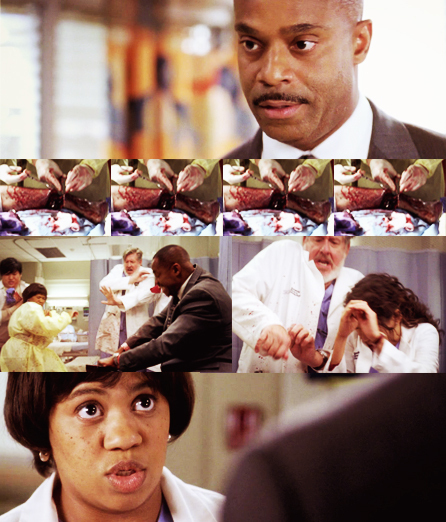 She’s probably the most hated character on Grey’s…minus Teddy, maybe. The now horribly disfigured young man who jumped in front of a bus to save a girl is finally able to communicate via palm writing the cryptic message: 007. Beat. HOLY CRAP. IT’S GEORGE! Yeah, that’s exactly what I yelled at that point. 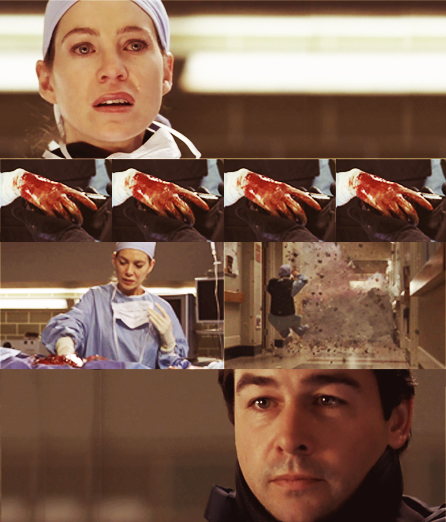 And the moment when Meredith realizes he is her long-time friend never ceases to give me chills. Suuper late, but I’m rewatching the show and holy crap. Just April’s face makes me irrationally angry even though she’s not that bad in the current season. Especially in 6.23. Like I just want to make an imprint in a concrete wall with her face. God.